I fisked New California Governor Gavin Newsom’s recent State of the State speech. It’s full of toxic Leftism as one would expect but there are points of interest. Allies, enemies and best of all, Newsom repeatedly confessing his incompetence to govern. Boldface are mine for reference. 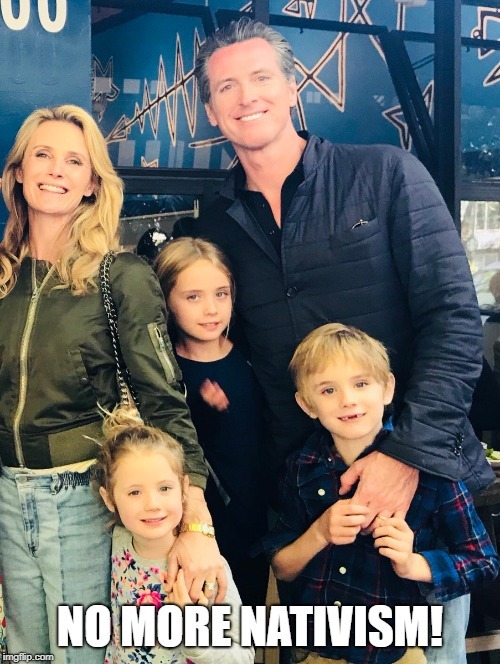 Gavin Newsom’s 2-year-old son, Dutch, stole the show at his father’s inaugural address. Carrying a blanket and pacifier, Dutch wandered on to a stage outside of the California Capitol and wouldn’t leave it as his father delivered remarks to an audience of lawmakers and former governors. No way that happened accidentally. The Governor used his own son as a political prop to endear himself to the wimmin. Strike that, it was probably Co-Governor Jennifer Newsom’s idea. I like to think that even Gavin has enough manhood to not see his child as a meal ticket. Either way, how unprofessional. The governor scooped Dutch up in his arms and continued delivering his speech. Dutch rested his head on his father’s shoulder as he spoke about sanctuary cities and immigration policy. All of whom are working in poverty at Walmart. If you don’t have the answers then you shouldn’t be Governor. GTFO so somebody competent can do the job. Gawddammit, *I* have the answers to all of those problems and I’m a nobody. Christ, Country, Fatherhood and don’t spend more than you earn. Boom, done. Interesting that Newsom equates immigration with LGBT perversion acceptance. The true “emergency” from his perspective is opposition to Globalism. Ah, the love and courage of Californians… overturned by judicial fiat so fugly Lesbians can fornicate in public. Del Martin in 1972. Eww! Only a woman could want to wife THAT up. I don’t see any Russians storming our borders, Gavin. And climate change? First it was nuclear winter, then it was global warming, now it’s climate “change” because you Leftoids can’t keep your lies straight. Even the Mexicans whose land they merely pass through don’t agree with you. This is an act of treason. Newsom is overriding Federal control of the California National Guard and taking them off the border for the specific purpose of thwarting national border security. It goes without saying that California’s fire problem… exacerbated by California’s infrastructure problem… is a State issue, not a national issue. Marijuana growing is no longer a Drug War concern. It’s a taxation and zoning concern post-legalization. His willingness to use the military on civilians is a problem of a different sort… unless, of course, those cartels are the illegal immigrants committing fewer crimes that he mentioned. Probably a smoke screen to avoid prosecution for treason. The trip from LA to Las Vegas may only take an hour by air, but the hassles associated with air travel have seen numerous proposals for a high-speed rail link between the two cities floated over the years. Lack of cash has usually proven the insurmountable hurdle, but after failing to secure a US$5.5 billion federal loan, XpressWest has found another way forward by teaming up with China Railway International USA in a joint venture that could see the link begin construction in late 2016. Sigh, that’s way too recent to be the scandal I was thinking of but thanks for the reminder of how welcomed China is with its billion-dollar investments in California’s infrastructure. If Newsom had any loyalty to the United States, this sort of collaboration with foreign powers would concern him. I’ve had the same thought about Trump but credit where it’s due, his trade war against the PRC has dried up the funds for such insidious behavior. For the moment of his Presidency. Still nobody doing perp walks. A recent post of mine handled this but let me say in passing, nobody in Central Valley has a commute worse than the Interstate 405 Parking Lot in Los Angeles. Newsom is lying his head off here and I’m not sure he even has a reason for doing it. Much more than a train project, it’s also about corruption, political favor-trading, money laundering, economic centralization and control of the population. Here’s a money laundering and population control example. “Opportunity Zones” are a concept straight from a Judge Dredd comic. Regions are targeted for “investment” by gov’t-bankster consortiums. “Vibrant”, he means. With land devalued by the cities being turned into giant barrios, the land can be bought up cheaply to create new, tiny kingdoms for the politically connected. Feudalism returns! And there’s the corruption and favor-trading. HAHAHAAA! You don’t have a choice. It’s THEIR money given for a project YOU mismanaged and abandoned. The hypocrisy between this and not repaying that $3.5 billion to the Feds is astonishing. Now we come to Newsom’s latest hiring decisions. Our water supply is becoming less reliable because of climate change. And infrastructure decay, as funds are diverted to welfare. And our population is growing because of a strong economy. That means a lot of demand on an unpredictable supply. There are no easy answers. Again, he says that. Again, an admission that Gavin doesn’t know how to solve California’s actual problems. Let me assist. California borders the Pacific Ocean, the largest body of water in the world. California is narrow; its distance from said Ocean is shorter than the currently existing aqueduct system. Desalination is a proven, mature technology and nearly all of California’s major cities are close to the ocean… but sadly, it’s the sort of work that illiterate Hondurans, single mothers and totalitarian globalists don’t want to do. I’m not familiar with it. It reads like an infrastructure upgrade to the aqueduct system, which is conceptually a dubious idea. A gigantic aqueduct network running through earthquake country is not an optimal choice for a city’s water supply but that’s how a large chunk of Los Angeles & outlying areas gets by. Los Angeles is doomed. But you knew that already. Gavin doesn’t have an answer to the water shortage but doesn’t like the answers other people found. You knew that already, too. We must have Unity of vision! My vision! Prior to his appointment to a State Water Board, Esquivel was a legal assistant to Senator Barbara Boxer. A politician who can’t win an election but has plenty of favors to trade. These are three different problems. In order, 1. Homelessness caused by gov’t subsidies for homelessness, 2. gov’t infrastructure neglect and 3. gov’t corruption. Oh, okay, they are one problem after all. Our current gov’t. It demands the gov’t do its freaking job and stop milking infrastructure problems like cash cows. They will work with my strike team to develop a comprehensive strategy that we will present within 60 days. We will ensure continued access to safe affordable power. We will seek justice [GQ: money] for fire victims, fairness [GQ: money] for employees, and protection [GQ: money] for ratepayers. We will continue to invest in safety, and we will never waver on achieving the nation’s most ambitious clean energy goals. From what I’ve heard by word-of-mouth, PG&E installed automatic reboot systems into its transmission lines. Most interruptions are caused by animals grounding the line which is a brief, one-time interruption as the critter is fried into charcoal and falls. Automating the reboot procedure makes it happen quickly enough to prevent interruption of service, compared to the older system of manually reconnecting a circuit breaker. Unfortunately, tree branches brushing against power lines is a recurrent grounding, not a one-time event. Bzzt-reboot-bzzt-reboot happening quickly enough (say, in high winds) gives the same sparking effect as a flint firestarter. The municipal equivalent of replacing a household fuse with a wire because the fuses keep blowing. I don’t know what kind of R&D was done on the reboot equipment but it sounds like a technical problem, not a credit rating problem. And procured by gov’t-mandated and -subsidized, expensive, eco-unfriendly, inefficiently low-scale utilities instead. Progress! They would be the parasites who produce nothing of value. They have trouble affording all kinds of stuff. Heh, charter school growth is a problem! Because the gov’t can’t directly control charter schools. Shouldn’t we be measuring pupil achievement, not money spent? “Our schools are failing because we spend only half as much money as neighboring states for the same result!” raises interesting questions of priorities. Transparency. He keeps talking about that. Newsom’s greatest recurring theme in this speech is concern that somebody, somewhere, might be secretly doing something he doesn’t approve of. The devil constantly tests his people for rebellious beliefs because he assumes they’re just like him: a shameless rebel. Phyiognomy: bitter feminist archetype. Confirming the hyphenated last name. We didn’t have these diseases when CONSERVATIVE, GOD-FEARING HOMOPHOBES ran the government! Maybe we should go back to what worked. Speaking of disease and homophobia, it’s interesting that Newsom didn’t mention the STD rates of San Fransicko. He worked hard to achieve that, yo! Their feces-tracking apps have thus far failed to reduce homelessness. I don’t think feeding & housing the homeless will get rid of them, either. How much would it cost to authorize police to hit them with sticks until they go away? Asking for a friend. The other 49 states in the Union will thank you as they bus all their homeless to your doorstep… at my expense. Yes, let’s talk about funding because pensioners and Squatemalans don’t pay the bills. This is a direct result of killing marriage and banning fatherhood. Everybody won when he died. His own pain ended, the taxpayer had one less mouth to feed and you got a talking point for your speech. First you used your toddler as a political prop, now your dead dad. Thank God I’m not related to you. This is not a government problem, how people handle their own old age. I had hoped Gavin would be talking about how to fund his $$$,$$$,$$$,$$$ moonbeams with an aging population, not how he could throw even more $$$ at retired Baby Boomers. Forget women, let’s take voting rights away from the AARP. Poor Arnold Schwarzenegger. Like Trump, his Governorship started off promising. Arnie even publicly accused Sacramento of being “girlie men” during budget season and it was awesome. (“Girlie men” used to be an insult.) But he backed down afterwards and became a forgettable governor. At the time, I thought he was unwilling to lose popularity in Hollywood. But maybe his wife undermined him instead. Marrying Shriver was not a smart move on his part. You’d think Arnold an okay guy if you ever met him but he isn’t the sharpest knife in the drawer. He’s manipulable. I’ve seen the Section 8 rent-controlled properties that California does. The parasite lives well here, too. You… you’re going to pay bureaucrats to do the job they’re already paid to do? Can you please be a little less overt with the bribes? The other States in the Union are already staring at us. There’s that Unity of (My) Vision again. Newsom wants to centralize political control of California. Northern California is particularly notorious for hostility to Sacramento, although it rarely reaches the point of civil disobedience. The region around Mount Shasta regularly tries to secede and create the state of Jefferson, IIRC. I’ve said it before, there’s a lot of Heritage Americans in California who don’t like the way things are going in this state. Looks like Newsom hates us as much as his predecessor did. Travis Allen is a California hero. He ranks with Don Grundmann for “most sane California politician”. Sickening that a lawsuit against him for loyalty to America was one of Newsom’s first priorities as governor. Fair share of housing? Wheatland’s population is 3,400. They grow walnuts there. Newsom is making open threats against the tiniest of his political opponents. What’s the real reason you are going after these people, Governor? Good thing you have all those Mary Sue Single Mothers on retainer. I’m sure they’d love to build you some tract housing and aquifer wells in thanks for all the welfare you’ve given them. Gavin Newsom is self-admittedly incompetent. Even his existence is illegal per new State laws against bullying. OH MY DOG ARE YOU KIDDING ME? We need socialist health care in order to keep costs down??? He’s not honest enough for even a snarking. That’s why our budget devotes more than $1 billion to increase rates and address the [medical] provider shortage. More “transparency” into the lives of proletariats, more $$$ for welfare queens. The definition of treason is aiding and abetting foreigners in defiance of Federal policy. Despite our rising wages, working families in California today barely earn more than they did a decade ago. What if I refuse to give my support? Will you back down on this or incarcerate me? Dynamex was a company that reclassified all of its employees as independent contractors to get around labor laws. Read more at the link below. I have no strong feelings on it myself but the case was influential… I believe Lyft/Uber use the same business model. I thought we already had a super-educated workforce. Did those PhDs not come with marketable skills? 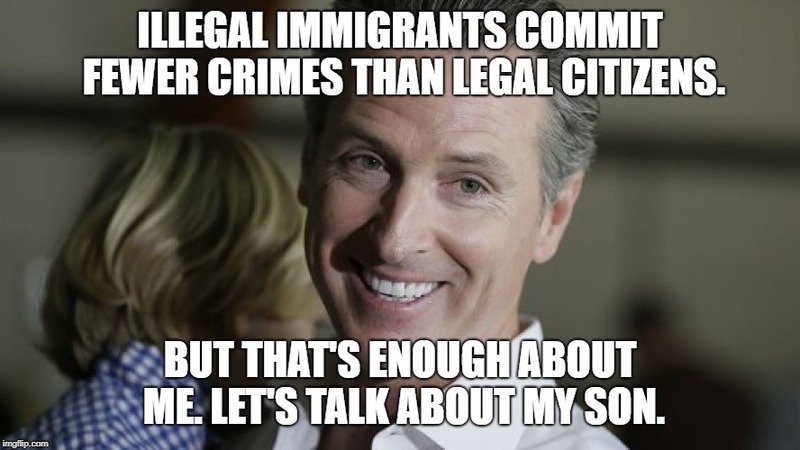 You incompetent turd bucket, Newsom. You didn’t see Trump begging other people to solve his problems, did you? You will never be one-tenth the leader that Orange Man is. At my inauguration, I quoted the Sermon on the Mount about a house that did not fall in the face of floods and storms, because it was founded upon a rock. … As St. Paul said, “we are many parts but one body.” We are all diminished when one of us struggles to lead a good life. Newsom ends his speech by invoking Scripture to justify his humanist rebellion against God. No, he’s not even doing that. He’s just mocking God during a victory lap. Remember the town of Wheatland that Newsom is threating into compliance with the Globalist agenda? It’s less than 100 miles from Paradise. There ain’t gonna be much more of that male martyrdom in the future. One wonders how Newsom plans to retaliate against us. Probably not at all; he probably expects us to keep showing up and dying. You will go to Eternal Hell, Gavin Newsom, for the many crimes you commit against God and California. Your speech was nothing but admissions of incompetence, promises of betrayal against national security, promises of loot to feral women and foreign nationals, threats against cities great & small who peacefully oppose your illegal, immoral, genocidal agenda and a Utopian vision of Government as God that is, by far, the most violent and bloodthirsty religion in recorded history. Humanity will never reach its best until you reach your final destination. You and your LGBT cronies. On the bright side, thanks for calling out some of your enemies. Now I know where to look for allies… and the stories the lamestream media won’t cover. ← High Speed Rail Refund!